Documents produced by the Situationist International or groups the Situationists were involved with during the mass strike and revolt of the glorious May 1968 in France. 2] Watch Out for Manipulators! Watch Out for Bureaucrats! 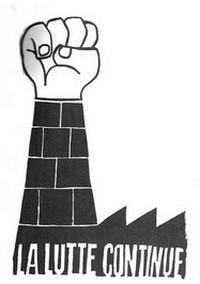 calls for the immediate occupation of all the factories in France and the formation of Workers Councils. Comrades, spread and reproduce this appeal as quickly as possible. No one must be unaware of the importance of the GA [general assembly] this evening (Thursday, May 16). Over the last two days several individuals, recognizable from having previously been seen peddling their various party lines, have succeeded in sowing confusion and in smothering the GAs under a barrage of bureaucratic manipulations whose crudeness clearly demonstrates the contempt they have for this assembly. WHO CONTROLS THE SECURITY MARSHALS? whose disgusting role is intolerable. WHY IS THE PRESS COMMITTEE -- which dares to censor the communiqués that it is charged to transmit to the news agencies -- composed of apprentice journalists who are careful not to disappoint the ORTF [national radio-television] bosses so as not to jeopardize their future job possibilities? Apart from that: Considering that the workers are beginning to occupy several factories in France, FOLLOWING OUR EXAMPLE AND WITH THE SAME RIGHT WE HAVE, the Sorbonne Occupation Committee issued a statement approving of this movement at 3:00 this afternoon. The central problem of this evening's GA is therefore to declare itself by a clear vote supporting or disavowing this appeal of its Occupation Committee. If it disavows the appeal it will have put itself on record as reserving for students a right that it refuses to the working class; and in that case it is clear that it will no longer want to concern itself with anything but a Gaullist reform of the university. The occupation of the Sorbonne that began Monday, May 13, has opened a new period in the crisis of modern society. The events now taking place in France foreshadow the return of the proletarian revolutionary movement in all countries. The movement that had already advanced from theory to struggle in the streets has now advanced to a struggle for control of the means of production. Modernized capitalism thought it had finished with class struggle -- but it's started up again! The proletariat supposedly no longer existed -- but here it is again. By surrendering the Sorbonne, the government hoped to pacify the student revolt, which had already succeeded in holding a section of Paris behind its barricades an entire night before being recaptured with great difficulty by the police. The Sorbonne was given over to the students in the hope that they would peacefully discuss their university problems. But the occupiers immediately decided to open it to the public to freely discuss the general problems of the society. This was thus a prefiguration of a council, a council in which even the students broke out of their miserable studenthood and ceased being students. To be sure, the occupation was never complete: a chapel and a few remaining administrative offices were tolerated. The democracy was never total: future technocrats of the UNEF [National Student Union] claimed to be making themselves useful and other political bureaucrats also tried their manipulations. Workers' participation remained very limited and the presence of nonstudents soon began to be questioned. Many students, professors, journalists and imbeciles of other professions came as spectators. In spite of all these deficiencies, which are not surprising considering the disparity between the scope of the project and the narrowness of the student milieu, the exemplary nature of the best aspects of this situation immediately took on an explosive significance. Workers were inspired by the free discussion and the striving for a radical critique, by seeing direct democracy in action. Even limited to a Sorbonne liberated from the state, this was a revolutionary program developing its own forms. The day after the occupation of the Sorbonne the Sud-Aviation workers of Nantes occupied their factory. On the third day, Thursday the 16th, the Renault factories at Cléon and Flins were occupied and the movement began at the NMPP and at Boulogne-Billancourt, starting at Shop 70. Three days later 100 factories have been occupied and the wave of strikes, accepted but never initiated by the union bureaucracies, is paralyzing the railroads and developing into a general strike. The only power in the Sorbonne was the general assembly of its occupiers. At its first session, on May 14, amidst a certain confusion, it had elected an Occupation Committee of 15 members revocable by it each day. Only one of the delegates, a member of the Nanterre-Paris Enragés group, had set forth a program: defense of direct democracy in the Sorbonne and absolute power of workers councils as ultimate goal. The next day's general assembly reelected its entire Occupation Committee, which had as yet been unable to accomplish anything. In fact, the various specialized groupings that had set themselves up in the Sorbonne all followed the directives of a hidden "Coordination Committee" composed of self-appointed organizers, responsible to no one, doing everything in their power to prevent any "irresponsible" extremist actions. An hour after the reelection of the Occupation Committee one of these "coordinators" privately tried to declare it dissolved. A direct appeal to the people in the courtyard of the Sorbonne aroused a movement of protests that forced the manipulator to retract himself. By the next day, Thursday the 16th, thirteen members of the Occupation Committee had disappeared, leaving two comrades, including the Enragés member, vested with the only delegation of power authorized by the general assembly -- and this at a time when the urgency of the situation demanded immediate decisions: democracy was constantly being flouted in the Sorbonne while factory occupations were spreading all over the country. At 3:00 p.m. the Occupation Committee, rallying to itself as many Sorbonne occupiers as it could who were determined to maintain democracy there, launched an appeal for "the occupation of all the factories in France and the formation of workers councils." To disseminate this appeal the Occupation Committee had at the same time to restore the democratic functioning of the Sorbonne. It had to take over or recreate from scratch all the services that were supposed to be under its authority: the loudspeaker system, printing facilities, interfaculty liaison, security. It ignored the squawking complaints of the spokesmen of various political groups (JCR [a Trotskyist group], Maoists, etc,), reminding them that it was responsible only to the general assembly. It intended to report to the assembly that very evening, but the Sorbonne occupiers' unanimous decision to march on Renault-Billancourt (whose occupation we had learned of in the meantime) postponed the meeting until 2:00 p.m. the next day. During the night, while thousands of comrades were at Billancourt, some unidentified persons improvised a general assembly, which broke up when the Occupation Committee, having learned of its existence, sent back two delegates to call attention to its illegitimacy. Friday the 17th at 2:00 p.m. the regular assembly saw its rostrum occupied for a long time by self-appointed marshals belonging to the FER [another Trotskyist group]; and then had to interrupt the session for the second march on Billancourt at 5:00. That evening at 9:00 the Occupation Committee was finally able to present a report of its activities. It was, however, completely unable to get its actions discussed and voted on, in particular its appeal for the occupation of the factories, which the assembly did not take the responsibility of either disavowing or approving. Faced with such indifference, the Occupation Committee had no choice but to resign. The assembly proved equally incapable of protesting against a new invasion of the rostrum by the FER troops, whose putsch seemed to be aimed at countering the provisional alliance of JCR and UNEF bureaucrats. The partisans of direct democracy realized, and immediately declared, that they had no further interest in the Sorbonne. At the very moment that the example of the occupation is beginning to be taken up in the factories it is collapsing at the Sorbonne. This development is more serious since the workers have against them a bureaucracy infinitely more powerful and entrenched than that of the student or leftist amateurs. To add to the confusion, the leftist bureaucrats, echoing the CGT [the Communist Party-dominated labor union] in the hope of being accorded a little marginal role alongside it, abstractly separate the workers from the students. ("The workers don't need any lessons from the students.") But the students have in fact already given an excellent lesson to the workers precisely by occupying the Sorbonne and briefly initiating a really democratic debate. The bureaucrats all tell us demagogically that the working class is grown up, in order to hide the fact that it is enchained -- first of all by them (now or in their future hopes, depending on which group they're in). They counterpose their lying seriousness to the "festivity" in the Sorbonne; but it was precisely that festiveness that bore within itself the only thing that is serious: the radical critique of prevailing conditions. The student struggle has now been left behind. Even more left behind are all the second-string bureaucratic leaders who think it's a good idea to feign respect for the Stalinists at the very moment when the CGT and the so-called "Communist" Party are terrified. The outcome of the present crisis is in the hands of the workers themselves, if only they succeed in accomplishing in their factory occupations the goals toward which the university occupation was only able to hint at. The comrades who supported the first Sorbonne Occupation Committee -- the Enragés-Situationist International Committee, a number of workers, and a few students -- have formed a Council for Maintaining the Occupations. The occupations can obviously be maintained only by quantitatively and qualitatively extending them, without sparing any existing regime. In the space of ten days workers have occupied hundreds of factories, a spontaneous general strike has brought the country to a standstill, and de facto committees have taken over many state-owned buildings. This situation -- which cannot last but must either extend itself or disappear (through repression or defeatist negotiations) -- is sweeping aside all the old ideas and confirming all the radical hypotheses on the return of the revolutionary proletarian movement. The fact that the whole movement was actually triggered five months ago by a half dozen revolutionaries of the "Enragés" group reveals even better how much the objective conditions were already present. The French example is already having repercussions in other countries, reviving the internationalism that is inseparable from the revolutions of our century. The fundamental struggle is now between the mass of workers -- who do not have direct means of expressing themselves -- and the leftist political and labor-union bureaucracies that (even if merely on the basis of the 14% of the active population that is unionized) control the factory gates and the right to negotiate in the name of the occupiers. These bureaucracies are not workers' organizations that have degenerated and betrayed the workers; they are a mechanism for integrating the workers into capitalist society. In the present crisis they are the main protection of this shaken capitalism. The de Gaulle regime may negotiate -- essentially (even if only indirectly) with the PCF-CGT [French Communist Party and the labor union it dominates] -- for the demobilization of the workers in exchange for some economic benefits; after which the radical currents would be repressed. Or the "Left" may come to power and pursue the same policies, though from a weaker position. Or an armed repression may be attempted. Or, finally, the workers may take the upper hand by speaking for themselves and becoming conscious of goals as radical as the forms of struggle they have already put into practice. Such a process would lead to the formation of workers councils making decisions democratically at the rank-and-file level, federating with each other by means of delegates revocable at any moment, and becoming the sole deliberative and executive power over the entire country. How could the continuation of the present situation lead to such a prospect? Within a few days, perhaps, the necessity of starting certain sectors of the economy back up again under workers' control could lay the bases for this new power, a power which everything is already pushing to burst through the constraints of the unions and parties. The railroads and printshops would have to be put back into operation for the needs of the workers' struggle. New de facto authorities would have to requisition and distribute food. If money became devalued or unavailable it might have to be replaced by vouchers backed by those new authorities. It is through such a practical process that the consciousness of the deepest aspirations of the proletariat can impose itself -- the class consciousness that lays hold on history and brings about the workers' power over all aspects of their own lives. What we have already done in France is haunting Europe and will soon threaten all the ruling classes of the world, from the bureaucrats of Moscow and Peking to the millionaires of Washington and Tokyo. Just as we have made Paris dance, the international proletariat will once again take up its assault on the capitals of all the states and all the citadels of alienation. The occupation of factories and public buildings throughout the country has not only brought a halt to the functioning of the economy, it has brought about a general questioning of the society. A deep-seated movement is leading almost every sector of the population to seek a real transformation of life. This is the beginning of a revolutionary movement, a movement which lacks nothing but the consciousness of what it has already done in order to triumph. What forces will try to save capitalism? The regime will fall unless it threatens to resort to arms (accompanied by the promise of new elections, which could only take place after the capitulation of the movement) or even resorts to immediate armed repression. If the Left comes to power, it too will try to defend the old world through concessions and through force. The best defender of such a "popular government" would be the so-called "Communist" Party, the party of Stalinist bureaucrats, which has fought the movement from the very beginning and which began to envisage the fall of the de Gaulle regime only when it realized it was no longer capable of being that regime's main guardian. Such a transitional government would really be "Kerenskyist" only if the Stalinists were beaten. All this will ultimately depend on the workers' consciousness and capacities for autonomous organization. The workers who have already rejected the ridiculous agreement that the union leaders were so pleased with need only discover that they cannot "win" much more within the framework of the existing economy, but that they can take everything by transforming all the bases of the economy on their own behalf. The bosses can hardly pay more; but they can disappear. The present movement did not become "politicized" by going beyond the miserable union demands regarding wages and pensions, demands which were falsely presented as "social questions." It is beyond politics: it is posing the social question in its simple truth. The revolution that has been in the making for over a century is returning. It can express itself only in its own forms. It's too late for a bureaucratic-revolutionary patching up. When a recently de-Stalinized bureaucrat like André Barjonet calls for the formation of a common organization that would bring together "all the authentic forces of revolution . . . whether they march under the banner of Trotsky or Mao, of anarchy or situationism," we need only recall that those who today follow Trotsky or Mao, to say nothing of the pitiful "Anarchist Federation," have nothing to do with the present revolution. The bureaucrats may now change their minds about what they call "authentically revolutionary"; authentic revolution will not change its condemnation of bureaucracy. At the present moment, with the power they hold and with the parties and unions being what they are, the workers have no other choice but to organize themselves in unitary rank-and-file committees directly taking over the economy and all aspects of the reconstruction of social life, asserting their autonomy vis-a-vis any sort of political or unionist leadership, ensuring their self-defense and federating with each other regionally and nationally. In so doing they will become the sole real power in the country, the power of the workers councils. The only alternative is to return to their passivity and go back to watching television. The proletariat is "either revolutionary or nothing." What are the essential features of council power? The present requirements are nothing less than this. Self-management is nothing less. Beware of all the modernist coopters -- including even priests -- who are beginning to talk of self-management or even of workers councils without acknowledging this minimum, because they want to save their bureaucratic functions, the privileges of their intellectual specializations or their future careers as petty bosses! In reality, what is necessary now has been necessary since the beginning of the proletarian revolutionary project. It's always been a question of working-class autonomy. The struggle has always been for the abolition of wage labor, of commodity production, and of the state. The goal has always been to accede to conscious history, to suppress all separations and "everything that exists independently of individuals." Proletarian revolution has spontaneously sketched out its appropriate forms in the councils -- in St. Petersburg in 1905, in Turin in 1920, in Catalonia in 1936, in Budapest in 1956. The preservation of the old society, or the formation of new exploiting classes, has each time been over the dead body of the councils. The working class now knows its enemies and its own appropriate methods of action. "Revolutionary organization has had to learn that it can no longer fight alienation with alienated forms" (The Society of the Spectacle). Workers councils are clearly the only solution, since all the other forms of revolutionary struggle have led to the opposite of what was aimed at. Translated by Ken Knabb (slightly modified from the versions in the Situationist International Anthology).